I started with an American-style IPA, brewed by Browar Raduga, a young gypsy brewery established in 2014 by a group of beer enthusiasts. They began homebrewing a while ago because the supply they got was not sufficiently diverse for them. 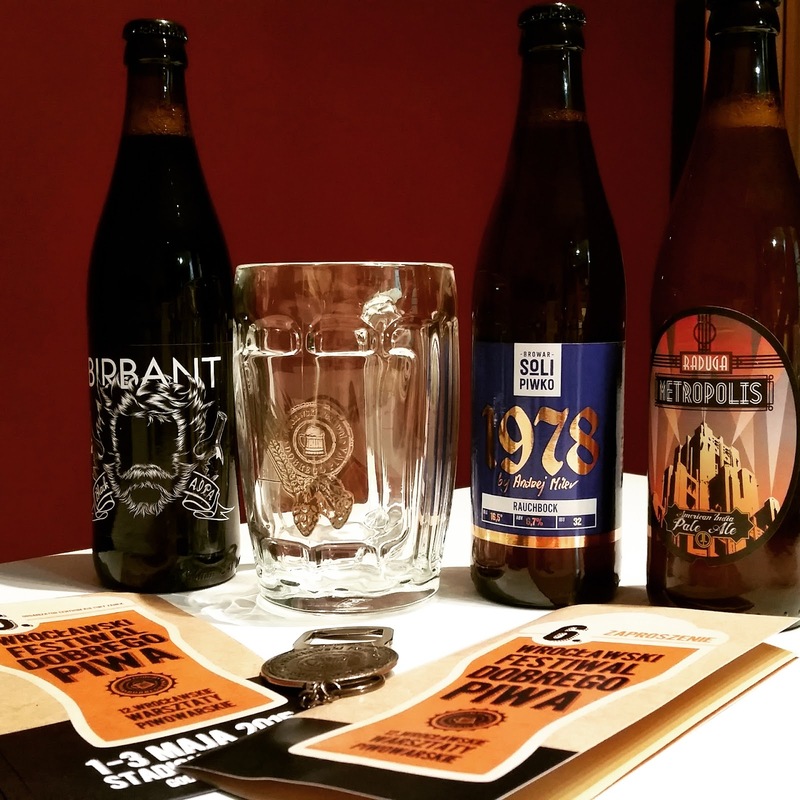 Since their appearance, they've launched up to 7 different beers, brewed at the facilities of Browar Witnica. The present beer uses a very American mix of hops: Citra, Cascade, Tomahawk, Amarillo y Simcoe; as well as wheat and barley malts. 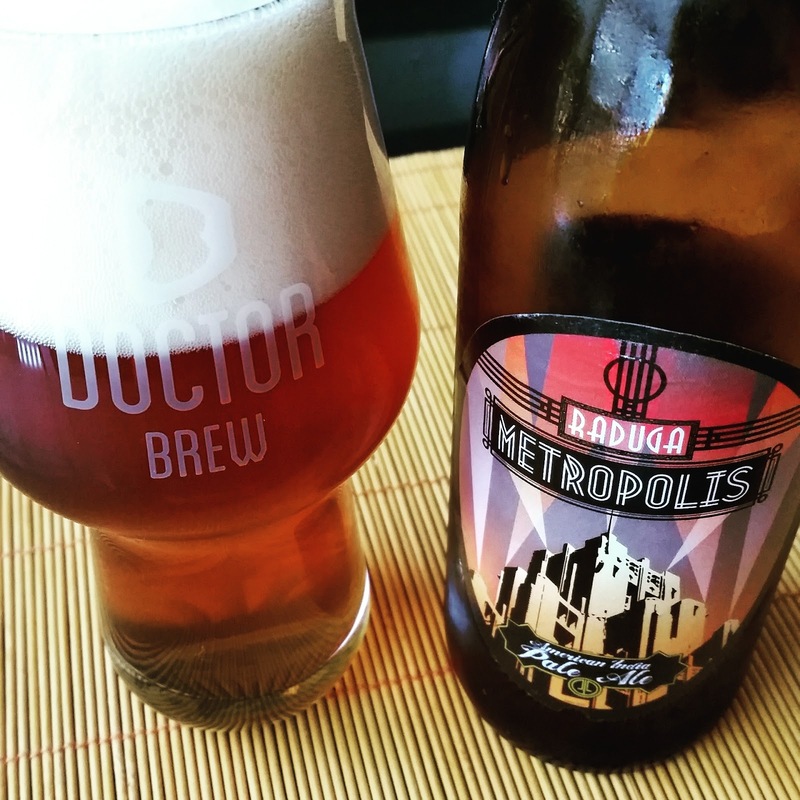 Metropolis shows a slight cloudiness, with tiny lively bubbles and a big durable white foam that leaves a nice lacing as it goes down. As expected, the aroma is fruity and citrusy, with grapefruit and mango notes, but also a little coconut -which amazes me given the hops used-. There is a caramel background too, and a light non-disturbing diacetyl touch. It goes down very smoothly, with citrus and fruits at the beggining, evolving to more tropical and caramelly hints, and with a quite piney aftertaste. A little butter again, but it is OK with me, being mild as it is. Medium body, quite bitter but with enough sweetness for balance, and a moderately dry finish. 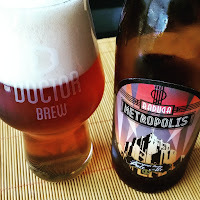 Even when the hops were not as fresh as they can get, Metropolis is still a top-notch beer. It goes down without notice for its great mouth sensation, and its lack of rough edges and flaws. The diacetyl hints are weird if they consider their beer to be an American IPA... but a little buttery touch is something I personally relish in some beers. Besides: do beer styles really matter? The beer is pretty good: that's the thing that should matter to consumers. 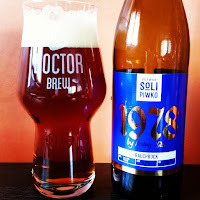 The next one results from a project started in 2014 by a homebrewer called Wojtkiem Solipiwko. 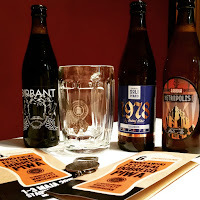 All of his beers have a homogeneous appealing branding that mostly plays with colours and letters, with very detailed labels that disclose interesting data such as water, malts, hops and yeast used, IBUs, ABV and BLG, as well as recommended consumption temperature and glass. Their portfolio offers diverse styles like a Milk Stout, a Black IPA and this 1978 smoked Bock. These beers are brewed in the premises of Browar Widawa, a brew-restaurant that I had the pleasure to visit. In the glass the beer is crystal clear, with an attractive copper colour and tiny bubbles. The froth is beige, formed in part thanks to the geometry of the glass, and timidly lasts throughout the drink. Before pouring it you could smell its nice mellow smoky character, Bamberg style, accompanying a mild but wide range of caramel hints and a light touch of herbal hops. It tastes intensely smoky, but with a balanced and smooth approach; not extreme at all. There is a general sweetness, contrasted by a little moderate bitterness and a herbal and slightly dry aftertaste. Very clean, with medium carbonation and a lightish body. "Rauchbock" is definitely a perfect term to describe what one can find in this beer of clear German inspiration in each of its facets. Highly drinkable and deliciously smoky, with a great balance that makes you unable to stop drinking it. I think I could have some every day. Let's proceed to the last one, produced by nomad brewers from Zielona Góra who funded their business in 2013. Just 2 years ago: impressive to see that they're the "veterans" from the current beer selection. The guys in charge are Jarek y Krzysiek, both of whom have had a significant previous experience in the industry: the former, working in various breweries, while the latter has been homebrewing for more than 10 years, winning several awards. 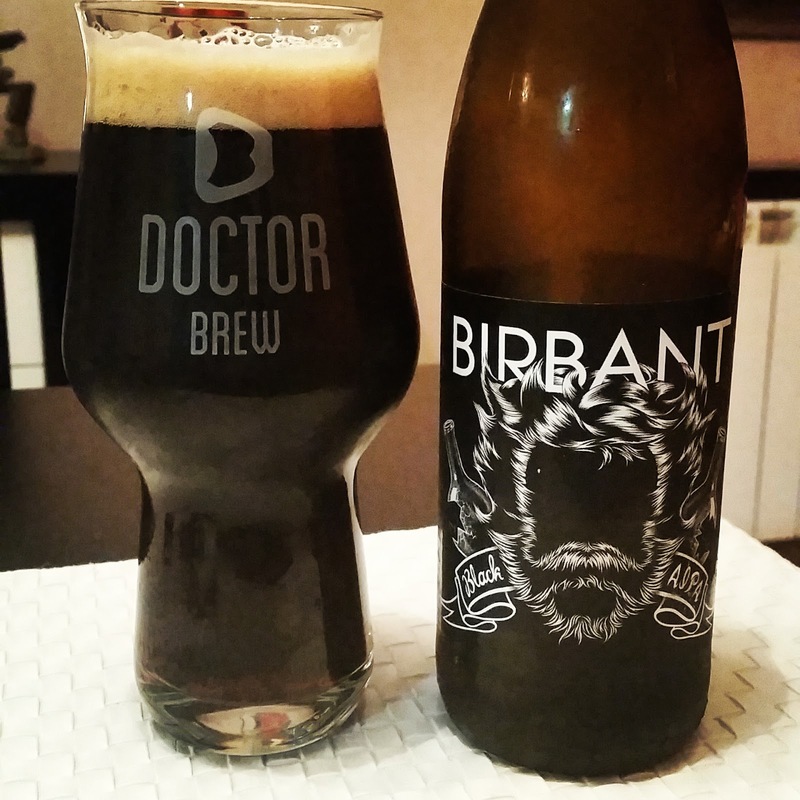 Birbant's Black AIPA is produced at the premises of Zarzecze, and it uses toasted, Pale Ale, Caramel and Munich malts, with Sorachi Ace, Centennial and Tomahawk hops. As I pour the beer I can see a black coloured beer with some amber tones, with fine and tiny carbonation that produces a toasty coloured froth, with a medium consistency, leaving a little lacing. Its aroma is a splendid combination of caramel and toasty malts and fresh hoppy hints. My first impression reminds me of after eight chocolate, developing to nice fruity hints of passion fruit, lime, orange and even a little coconut. In the mouth more of the same, with a fresh hoppy beginning, a nice smoothness throughout and an aftertaste that brings some nutty touches to my palate. Medium body and a good carbonation that, along with hops, would really help cleaning the tongue in case I matched the beer with fatty food. In conclusion, a Black IPA that does not forget its malty part, formidably accompanied by hops. Another great beer: tasty and very appealing for its smoothness and good balance. I would like to underline the fact that every one of the labels gave lots of information about the beer ingredients and other technical details. This can either be indifferent or very interesting for the consumer. It would be great if local brewers could please grab a notepad and take note of this aspect. 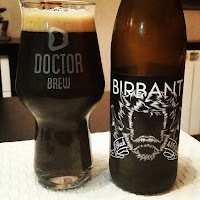 I also hope Polish brewers never ever get to that familiar utter stupidity of "secret hops" and unique combinations of "confidential malts". It makes one think about the self-confidence some might have as brewers. Having said that, after having tasted all these beers, I feel quite astonished as to what these very young breweries can already achieve. These three beers comply with a very high standard of quality and finish. I will write more about it on part II of the beers in Wroclaw, but to me this is just one more proof that Polish beers will soon be regulars in many pubs across Europe. I'm with you on the ludicrous "secret hops" and "selected malts" thing. Pet peeve of mine and a horrible waste of label space. Always nice when a brewer uses the label to put forth relevant and interesting information instead of that kind hogwash. Polish beers: unheard of in Belgium and more's the pity, it seems. Thanks for your comment, Jo. A pity, indeed. Poles are already brewing very nice beers, and they can just get better with time. I'm sorry that I dont have any spare ones for when you come.